Loading docks are among the busiest—and most hazardous—workplace locations across all industries. Today’s business challenges, such as increased order volume from growing online sales and customer expectations of expedited shipping times, put pressure on loading dock environments to be even more fast-paced and efficient than ever. But that focus must not distract from awareness of the dangers of those environments. According to data from the Bureau of Labor Statistics and the Occupational Health and Safety Administration (OSHA), falls are consistently one of the top causes of workplace injuries and fatalities, and an average of three people a year die in loading dock falls, with more injured or killed in forklift-related dock accidents. Besides personal injury and loss of life, accidents cost time, money, and material or equipment losses. Safety must remain a top priority on the loading dock. Smart warehouse and shop managers recognize the importance and value of providing the best quality protection. 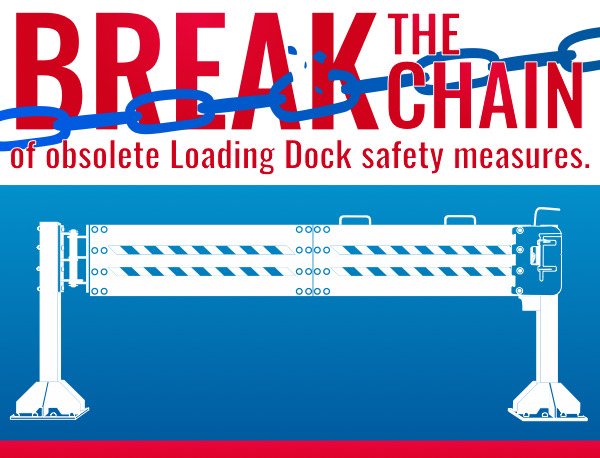 We attended the 2017 PROMAT Expo in Chicago this past spring and spoke with other safety product manufacturers, all of whom agreed that the safety chain is obsolete when it comes to loading dock protection. Chains are insufficient in stopping personnel and equipment from falling off dock edges. For that level of protection, and to meet OSHA and ANSI standards, you need a full barricade system: a loading dock safety net or gate. US Netting’s loading dock safety nets are grids of heavy-duty polyester webbing fastened with hooks and adjustable straps. They can be wall-mounted or post-mounted on steel bollards, which add strength and door frame protection. Our Defender Gate™ and Ultimate Defender Gate™ Plus feature double rail panels made in the U.S. from top-quality steel. Both barrier types offer several significant advantages over chains. Perhaps one reason for the prevalence of chains is that they are extremely simple to use. But so are nets and gates. Both system types come with everything needed for straightforward installation. Once installed, nets can be put up or taken down in just a few minutes, fastening the hooks and tightening the straps or unhooking and rolling up the net. Gate operation is even faster. The gates are hinged in the middle to fold in half and swing out of the way after being unlatched. Unlike barrier arms that swing straight out or up, requiring large clearances, our gate products can be operated in tight spaces. The standard design opens to the left, but they can be custom built to open to the right to suit any dock configuration. The latch can also be padlocked for extra security. The patent-pending design and EasyGlideTM technology make opening and closing the gates smooth and simple. Our nets and gates are manually operated rather than automatic, because automatic barriers are simply not practical. The necessary electronics or hydraulics can pose additional hazards or problems when exposed to the elements; and the more parts that are involved, the more ways a product can potentially fail. Our nets and gates are built for constant use and, once installed, are virtually maintenance-free. OSHA and ANSI standards specify that wall opening safety barriers must be 42” in height. But a chain or arm-style single rail installed at that height will do nothing to prevent personnel or material from slipping underneath and falling off the dock edge, nor will it stop unauthorized crawl-throughs. Loading dock safety nets cover the entire vertical surface area from the floor to the top edge, offering more complete protection. They can also include optional debris liners to prevent leaves or trash from blowing through open doors, keeping the work area clear. As a result of customer feedback, the Defender Gate™ and Ultimate Defender Gate™ Plus feature a second rail panel that provides extra protection against sliding under the main rail. This additional panel makes the gate meet or exceed regulatory guidelines, yet does not add excessive weight or interfere with ease of operation. Chains, even with additional safety signs attached, can be difficult to see. But there is no mistaking whether our nets and gates are open or closed. The net webbing is a bright safety orange, and the steel gates are powder-coated in canary yellow with additional red and white striping detail. This visibility makes it easy for workers to gauge whether they are a safe distance from the dock edge. It also means employees are more likely to be vigilant about putting up the net or closing the gate. Finally, these barriers send a clear visual signal to workers, customers, and other visitors that your company cares about safety. In addition to covering more surface area, nets and gates are stronger than chains because—unlike chains—they don’t rust. Corrosion leads to weak links that are more likely to give way. The durable polyester webbing of the nets and the powder-coated steel of the gates don’t have that problem. OSHA regulations specify that a barrier must be able to withstand at least 200 lb. of force applied at the midpoint. Our nets and gates excel in that regard and have undergone repeated and rigorous testing to prove it. Wall-mounted nets and standard safety gates are lighter-duty and can stop handcarts or walk-behind pallet trucks. Post-mounted nets can stop a forklift moving at 4 mph, and the flexibility of the webbing means it takes repeated hits to cause extensive damage. But the Ultimate Defender Gate™ Plus is the most powerful of all. The corrugated steel panels can stop a 13,100-lb. forklift at 4 mph, and they can withstand 7 such slams before giving way. Almost all of the safety manufacturers we spoke to at PROMAT believed that no current product was capable of keeping a forklift from falling off a dock. They haven’t seen our gates in action. Loading dock accidents can carry terrible costs: lost productivity when a worker is sidelined by injury or while an accident is investigated; damaged goods or equipment; expenses of workman’s compensation or lawsuits, or potential fines for insufficient safety measures; and most terrible of all, loss of life. Upgrading your safety system from simple but inadequate chains can be a significant initial expense, but a worthwhile one. If a net or gate prevents even one loading dock accident, it will more than pay for itself.